Experimental music ensemble thingNY presents “Ladies Night” – Volume 6 of its Seven Immediacies Series, the program will include exciting new sets from saxophonist Rhonda Taylor, electronic sound artist n0izkmr, featuring visualist invaderbacca, and vocalist/multi-instrumentalist Sukato. The evening will finish with the premiere of “Wind Factory” a work for roomful of winds, by thingNY’s Erin Rogers. This music series is thingNY’s first official foray into curating a series as a group. Each installment of the series will pair local and visiting emerging classical and experimental artists with a new work, difficult to program because of its extreme length or unusual ensemble. New Mexico based saxophonist Rhonda Taylor will start at 8pm with Pre-Millennium Tension, a collection of solo saxophone works originally written between 1983 and 2000, exploring the extraordinary timbral and textural possibilities of a single voice. Works featured will be El Avion Grande and Audition, both by Rick Burkhardt, Anubis et Nout by Gérard Grisey, Interstice by Avi Tchamni, and Not Pitch by Ben Grosser. n0izmkr will follow with a structured improvisational noise set, including circuit bent instruments, handmade synthesizers, custom midi controllers, environmental samples, and a contact mic orchestra, the set will be interpreted by visualist invaderbacca. Finally, Sukato will perform an electric-saz and voice set with back-up electronic tracks and the program will finish with the premiere of “Wind Factory” a work for roomful of winds, by thingNY’s Erin Rogers. Rhonda Taylor is dedicated to the creation and performance of meaningful sonic art of our time. Her solo recordings can be found at cdbaby, iTunes, and amazon.com. Upcoming projects include working closely with Steve Takasugi on a new work for solo saxophonist and electronics, premiering a new work for alto saxophone and electronics by Avi Tchamni, and taking part in a consortium commission of a new work for baritone saxophone and electronics by Nathan Davis. Dr. Taylor has been on faculty at New Mexico State University since 2003, where she is the College Assistant Professor of Saxophone and Music Theory. Rhonda Taylor is a Conn-Selmer artist and plays on Selmer Paris saxophones exclusively. Nicole Carroll (n0izkmr) is a classically trained electroacoustic composer, who also works with video and handmade electronic instruments. Through her music and video works, Carroll seeks to build relationships with audiences though multi-disciplinary art experiences. She utilizes circuit bent toys and hacked hardware in performance to provide a visual element to the electroacoustic performance process. Her compositional focus is exploring sonic and artistic possibilities, while presenting material in manner that is accessible to her audiences. Carroll resides in Brooklyn, NY, where she freelances as a sound designer for theater, and builds custom midi controllers and hacked instruments for electronic musicians and digital media artists. During her free time she explores nature and collects sounds from unlikely sources, in unlikely places. As n0izmkr, she performs live electroacoustic sets for whoever is listening. Invaderbacca sees the colors that nobody sees. His approach to visualizing the sounds around him is almost sonic itself in nature, whether he’s creating frenetic glitchnes sets or creating his own spasmodic video blasts. Sukato is a vocalist, multi-instrumentalist, composer and improviser. She studied at the Juilliard School, and later, at Eastman School of Music, became interested in ethnomusicology and the possibilities of the voice. She collaborated with composer/poet Kala Pierson on Axis of Beauty, an evening-length performance in memory of Iraqis killed since the U.S. invasion, featured at the Tribeca Center of the Performing Arts. She appeared as Moby’s video “I love to move in here” (as an extra). 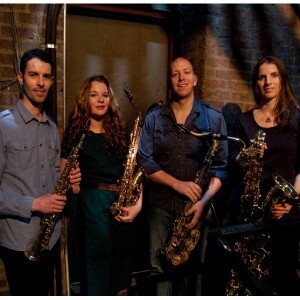 From Alberta, Canada, now based in New York City, Erin Rogers is a saxophonist and composer. Her works have been performed by New York-based groups such as the Gotham Ensemble and IKTUS as well as Austin Symphony concertmaster Jessica Mathaes, Chicago’s Anubis Quartet and Madrid’s Tribuna Sax-Ensemble. She has performed with ensembles such as the Lost Dog Ensemble and Fireworks and is a founding member of thingNY and the New Thread Saxophone Quartet, an ensemble of elite musicians committed to the creation and performance of saxophone quartet repertoire from New York’s burgeoning new music scene. Erin completed undergraduate studies at the University of Alberta and, in 2005, received master’s degrees in composition and performance from Bowling Green State University. Visit www.erinmrogers.com for more information. Please join the New Thread Quartet at The D’Addario NYC Studio on Friday, June 9th, for a season finale concert and fundraiser. We have a lot planned for the event: music from an exciting group of NYC-based composers, a great line-up of guest performers and a generous selection of silent auction and raffle items provided by D’Addario. Hors d’oeuvres and refreshments are complimentary, including wine and beer. Concert will feature works by Martin Bresnick, Richard Carrick, Gilbert Galindo, Anthony Gatto and Erin Rogers. The fundraiser is aimed at covering our travel and lodging in St. Andrews, Scotland this July. We’ve been selected from an international pool of saxophonists to participate in the World Saxophone Congress 2012. It’s a tremendous honor for us to be chosen for this opportunity, and your support will help us get there. Fireworks joins forces with the choir/composer collective C4 Ensemble on four works for amplified ensemble and chorus, including the premiere of Brian Coughlin’s “Requiem” on June 2. The fifth installment of its Seven Immediacies Series will focus on “the body” in musical performance. The audience will enter in the middle of the first of two pieces from Panoply Performance Laboratory and thingNY’s collaborative experiment, TIME: A Complete Explanation in Three Parts. Los Angeles based composer and vocalist Odeya Nini will perform A Solo Voice, and present In Light of Darkness, for solo piano, performed by Paul Pinto. Composer and massage therapist Jason Anastasoff leads the performance of a new work for large ensemble and masseuse. Finally, thingNY and PPL resume their interminable performance for the rest… of… time. The Seven Immediacies Series is new music ensemble thingNY’s first official foray into curating a series as a group. Each installment of the series will pair local and visiting emerging classical and experimental artists with a new work, difficult to program because of its extreme length or unusual ensemble. Fireworks joins choir/composer collective C4 Ensemble on four works for amplified ensemble and chorus, including the premiere of Brian Coughlin’s Requiem.